Kira Schlegel is studying MSc Applied Positive Psychology and Coaching Psychology at UEL. She blogs about psychology for Your Universe. We have already entered the last three months of 2018 – crazy, isn’t it? I often use the first day of a month to reflect on the last month’s experiences – on successes, on learnings, on my favourite moments. These reflections not only make me happier, they also make me mindful. ‘Mindfulness’. So many people have been talking about this topic recently. But what does it mean? Brown and Ryan (2003) defined it as a “state of being attentive to and aware of what is taking place in the present.” Sounds so easy. However, it is simple but not easy. In our fast-paced world, we have been taught to do at least two things at the same time. We have been taught to always think ahead. We have been taught to complete tasks as fast as possible. Research, however, shows that this lifestyle can lead to enormous negative consequences: people feel stressed, they suffer from illness, and they make mistakes. Luckily, we have a simple ‘tool’ that helps us to become more mindful: our breath. Being attentive to our breath has been correlated with enhanced wellbeing and health. People who are able to focus on their breath when they feel stressed can step back and observe the situation from a distance – which helps them to see the bigger picture again. Lots of research has shown the positive consequences of regular meditation and mindfulness in laboratory settings. Nevertheless, there is not much research that has detected the consequences of mindfulness practice in people’s daily lives. Therefore, I have decided to write my dissertation about mindfulness. 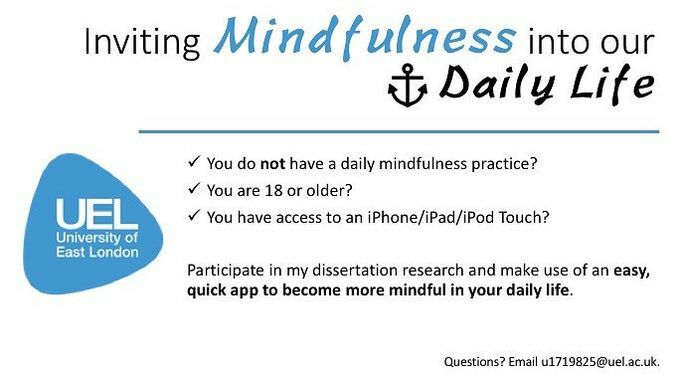 The study will take place at the end of this month, and participants are asked to use an app that helps them to become more mindful for two weeks. The more people participate, the more valid my results, so I am looking for YOU to take part! The amount of time required to take part each day is between 5 and 15 minutes. If this sounds interesting to you, please sign up here to get more information about the study. If you have any questions, please send me an email (u1719825@uel.ac.uk). I am so excited for the study’s results and will definitely share them with you at the beginning of next year!